Bharat Sanchar Nigam Limited (BSNL) along with Patanjali Ayurved announced Swadesh Samriddhi mobile SIM cards with very competitive Telecom plans. With simple partnership with BSNL telcom, Patanjali will not only boost the BSNL revenue, but it will increase the brand penetration much deeper in India. You must read complete page to understand the broader perspective. Baba Ramdev along with Acharya Balkrisha started swadeshi movement where they are producing and promoting Indian Products. 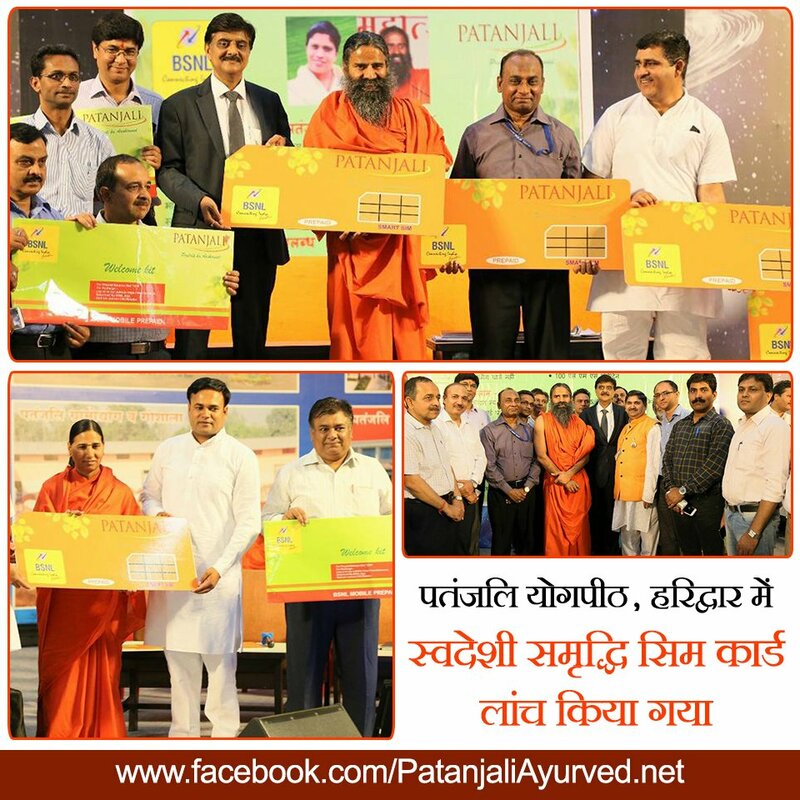 Patanjali has moved far ahead from ayurvedic medicines or Yoga education to competing National FMCG or Retail sector. In Feb-2018 BSNL partnered with Nokia a finnish company for VolTE technology implementation on BSNL network. BSNL is offering 4G and also 2g, 3g using hte Single Radio access network provided by Nokia. This will cut the cost of operations for age old technology and provide better HD voice quality service to subscribers. Thats how BSNL is able to offer competitive plans to JIO or Airtel. 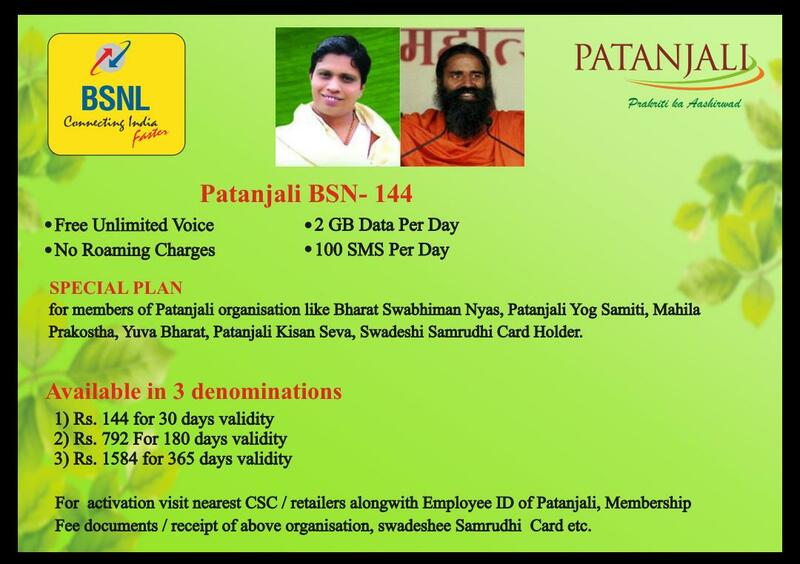 It may sound like Patanjali is getting into telecom sector by partnering with BSNL and offering SIM cards, the real game is different. There is another company who has already played this game. It is Future Group who have retail outlets like Big Bazaar, they have tie up with Tata Telecom and offer T24 SIM under the joint venture. In case of T24 SIM what you get is free recharges as much you shop from Future Bazaar outlets. Whole concept is not to sell SIM card but to reach out to customer for promotion of new products through SMS notifications. All the SIM cards automatically becomes subscribed to the network. In case of Patanjali what they are going to get is huge customer base for free promotion through SMS notification. Actually Patanjali is going to earn more by creating awareness about their products and generating sales for that.